This is a great, nutritious combination that goes well with simple grilled meats or fish. 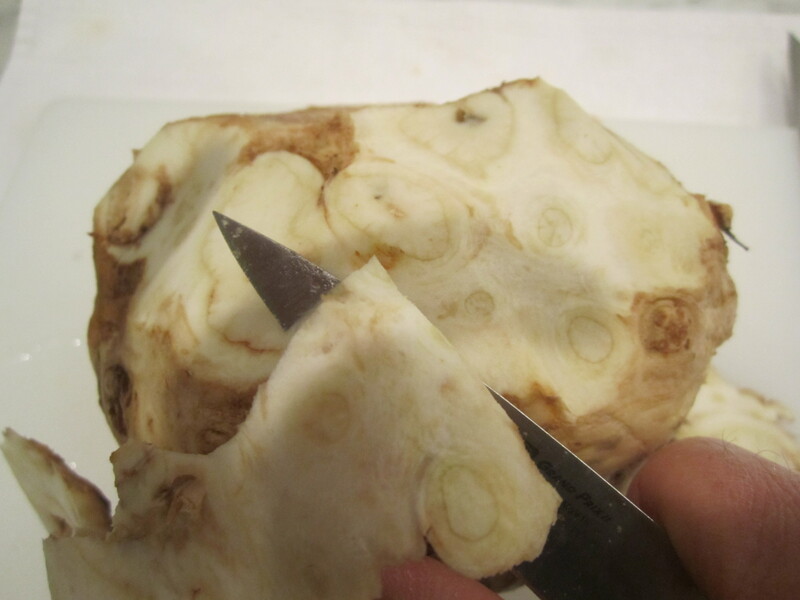 Celery root is available year round and, like most root vegetables, despite its dirty, craggy exterior, what’s inside is sweet and complex. The dish begins with peeling the celery root, so that all the rough, irregular exterior is removed, to expose the white flesh underneath. Like potatoes, it must be peeled at the last minute, or else it will blacken quickly at room temperature. 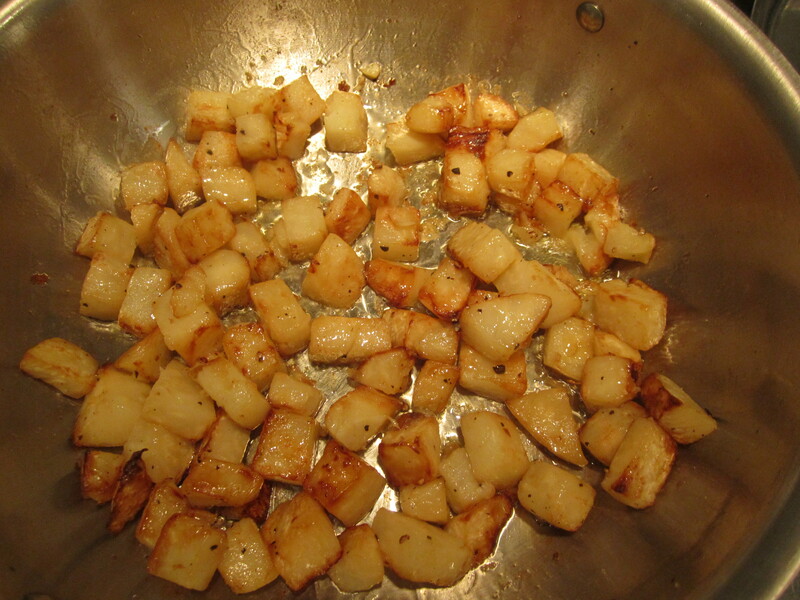 The root is sliced and diced into 3/4″ cubes which are immediately placed in a skillet of heated olive oil. The skillet is covered to allow the cubes to steam and soften while they become caramelized. Toss every couple of minutes–you’ll smell the wonderful aroma of caramelization very quickly. 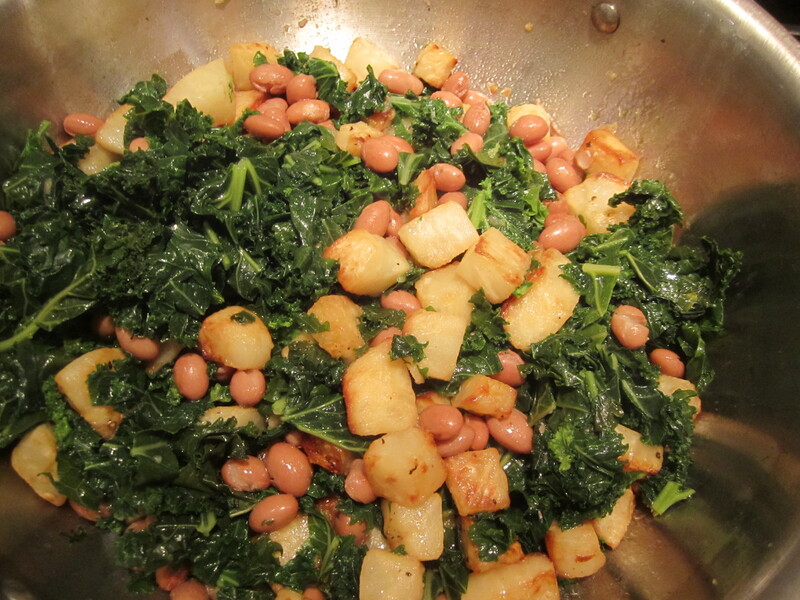 Once the root is golden and mostly soft, add a can of cranberry beans (or fresh beans that have been boiled to al-dente firmness), and a bunch of cooked kale. A bit of chicken broth brings all the flavors together and helps the kale and beans heat through. 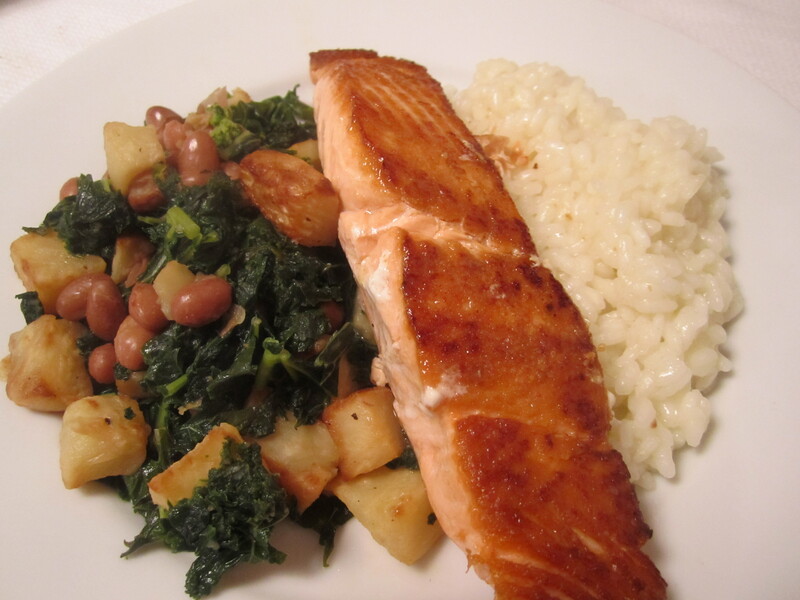 Tonight, we had this dish with pan roasted salmon (for salmon cooking technique, see salsa verde with pan roasted salmon) and some plain boiled arborio rice. 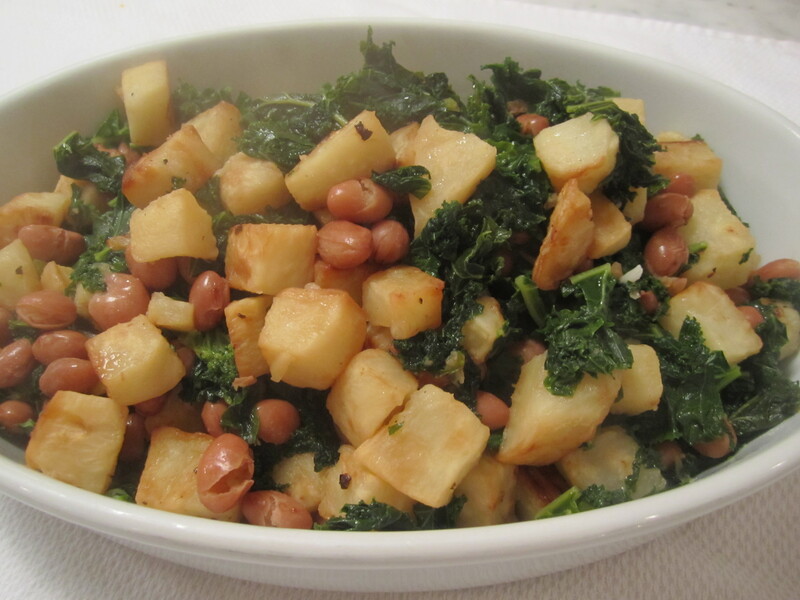 This is a good side dish for company because it’s ingredients are all very sturdy–the celery root can be caramelized ahead of time, then the kale and beans heaped on top until ready to heat and serve. 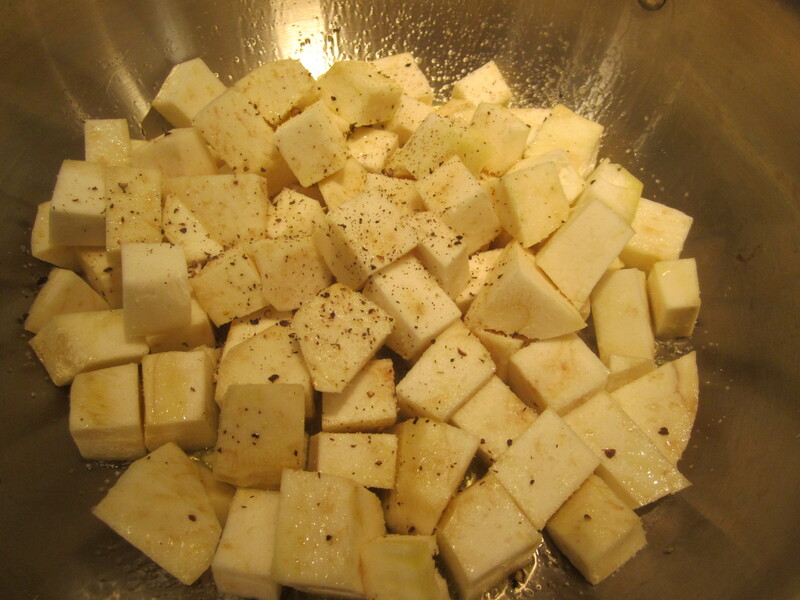 Peel celery root and dice into 3/4″ cubes. Heat oil on high in a skillet large enough to hold all ingredients. Add celery root and lower heat to medium. Sprinkle with salt and pepper and cover. Stir and shake every couple of minutes until golden and tender–about 15 – 20 minutes. 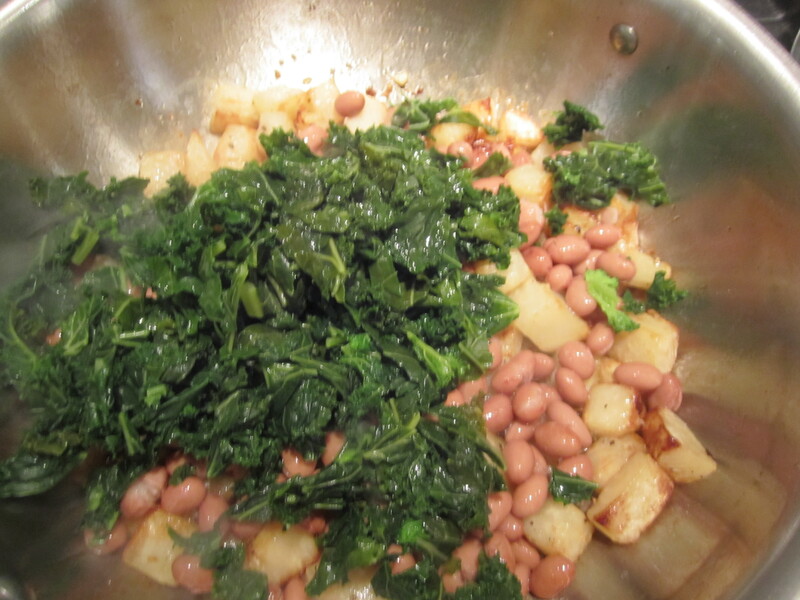 Add beans, kale and broth and cover for another 5 minutes. Cook, uncovered until most of the broth has evaporated and everything is nicely combined. Add salt and pepper, if necessary–lots of black pepper is good here.